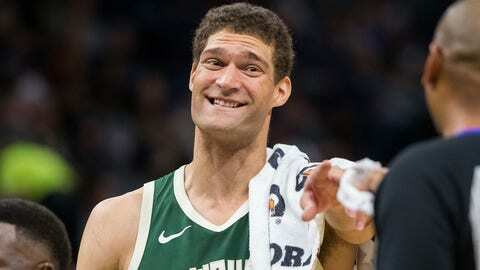 Brook Lopez, the 29-year-old 7-footer and super nerd, went six years and nearly 400 NBA games without making a 3-pointer. He made exactly three in 53 games at Stanford, then waited 369 games to make his first as an NBA player. This approach has not been an unproductive one. Lopez has an All-Star nod (2013) and two playoff appearances to show for 10 years of productive post play, along with career averages of 17.8 points, 6.7 rebounds, 1.7 blocks and 1.6 assists per game. That’s been worth nearly $121 million to this point, per Spotrac. He began flirting with the 3-ball during the 2016-17 season, averaging 5.2 attempts per game, then 4.4 per game a year later, shooting a respectable 34.6 percent on 712 attempts over that span. Milwaukee’s new head coach has the Bucks attempting a whopping 40.5 3s per game, second only to Houston this season. Even center John Henson, as 3-averse a player as has ever existed, is averaging 2.2 tries per game under Budenholzer. Lopez, however, is perhaps the most notable beneficiary of Budenholzer’s teachings. Lopez is attempting 7.2 3s per game while shooting 41.9 percent from deep, both career highs, and he’s only getting better. Lopez has hit six-plus 3s in three of his last four games, and followed up a 6-for-12 outing against the Clippers with an 8-for-13 showing against Denver on Sunday. Minor milestones might not mean much to the Bucks, but Lopez’s shooting was a big factor in their 121-114 win over the Nuggets on Sunday. Lopez went off with the Bucks down 74-73 in the third quarter, hitting 5 straight 3-point tries to put Milwaukee in front 93-83. It was just the fifth time this season that a player — any player — has hit eight-plus 3s (Brooklyn’s D’Angelo Russell made it six the next night). Just 12 players have hit seven-plus in a game. The rest: Steph Curry (three times), Tim Hardaway Jr., James Harden, Joe Ingles, Khris Middleton, Cameron Payne, J.J. Redick, Derrick Rose, Klay Thompson and Kemba Walker (twice). Notably, none of those guys are 7 feet tall. The only other center (as listed by basketball-reference.com) to make eight 3s in a game was Channing Frye for Phoenix on April 11, 2011 (he had nine). Frye is listed as 6-foot-11, 255 pounds. Lopez is 7-0, 275.